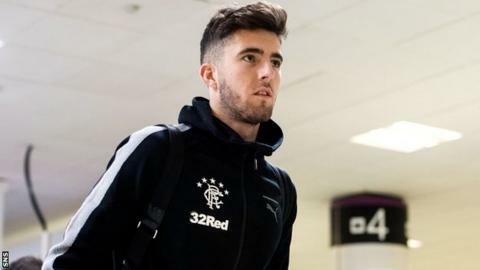 Rangers manager Graeme Murty reckons Sean Goss can make a major difference to the Ibrox club's style of play. Midfielder Goss, 22, moved from Queens Park Rangers on a six-month loan deal this week and joined the squad as they left for Florida on Saturday. Murty revealed Goss has been a long-time target and believes he can prove crucial against more defensive sides. "We've been very good in games where people have come to us and been in our faces," Murty told his club website. "We've managed to match that intensity. Now we need to dictate tempo and dictate the flow of the game and hopefully Sean can help us do that. "We need someone who can really disrupt their lines, beat their block if they are going to be a solid unit and extend the range of our attacks from side to side on the pitch. "He gives us control in the middle of the pitch, an increased ability to get the game started from back to front, a wonderful left foot with a good range of passing and a composure. "Hopefully that means we can dictate the tempo of the game more than we have done currently." Goss started his career at Exeter City then spent five years at Manchester United before moving to Loftus Road in January 2017. He has made only six first-team appearances for QPR, but Murty insists the Ibrox outfit identified him as a key target. "He's been on the radar for a while," Murty added. "Our recruitment team have done a fantastic job of identifying targets that possess certain attributes. "That was one that we thought was critical given the nature of the games that we tend to play in, particularly at home, where people can sit in and take advantage of the big spaces at Ibrox. "He's been likened to Michael Carrick and I think that's heavy praise for a young man, but we see his range of passing and hopefully he can bring that to us. "He was desperate to come and play for us, but he is a young man, he's a young hungry player. "The fact that he left Manchester United to go and get regular football speaks volumes about him as well I think."